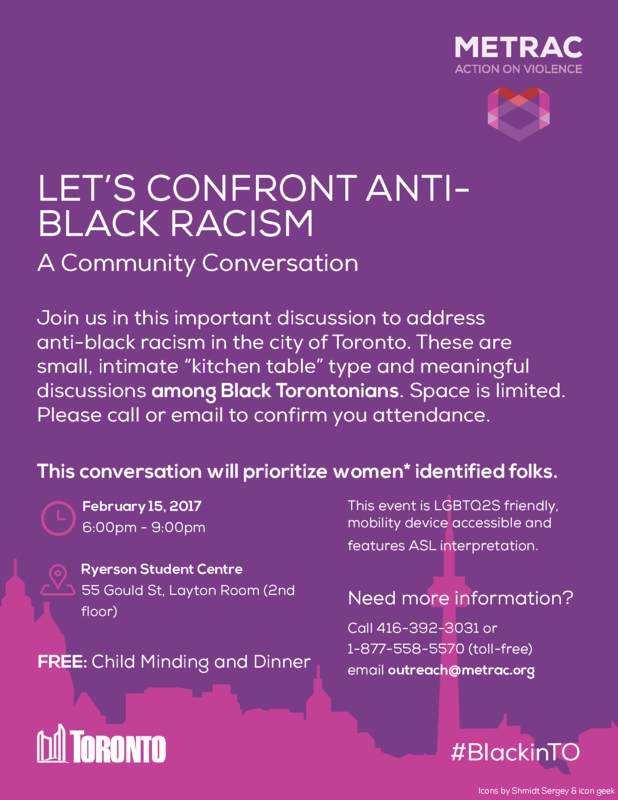 Join us in this important discussion to address anti-black racism in the city of Toronto. These are small, intimate “kitchen table” type and meaningful discussions among Black Torontonians. Space is limited. Please call or email to confirm you attendance. This event is a space for Black Torontonians. This conversation will prioritize women* identified folks. It will be held in the Layton Room on the 2nd floor of the Ryerson Student Centre. METRAC will be offering free child minding, free food and ASL interpretation during this event. For more information or to RSVP, email Gilary at outreach@metrac.org. Access the participant’s guide here! *For us, women includes any persons who may identify, or may have once identified, as feminine, female, cis or trans. Part of the City of Toronto’s Toronto for All campaign.